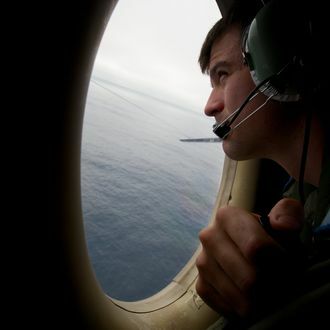 An Australian navy ship searching for Malaysia Airlines Flight 370 detected signals "consistent with those emitted by aircraft black boxes," Air Chief Marshal Angus Houston, head of the Australian agency coordinating the search, said in a press conference on Monday. The vessel, the Ocean Shield, picked up the signals twice on Sunday, the first time for two hours and 20 minutes. "The second detection on the return leg was held for approximately 13 minutes," said Houston. "On this occasion, two distinct pinger returns were audible. Significantly, this would be consistent with transmissions from both the flight data recorder and the cockpit voice recorder." As with most developments in the search, there’s some confusion surrounding the “pings” from the black boxes. On Friday and Saturday a Chinese ship detected similar signals about 300 nautical miles from where the Australian vessel is searching, and according to the Washington Post, it’s unlikely that the pings came from the same source. While he described the Australian ship’s discovery as “a most promising lead,” Houston stressed that “we haven’t found the aircraft yet.” Once the Ocean Shield zeroes in on where the sound is coming from, it will lower an autonomous vehicle into the water to search for wreckage on the sea floor. The process could take days, and the batteries in the black boxes are expected to run out sometime this week. “In very deep oceanic water, nothing happens fast,” said Houston.